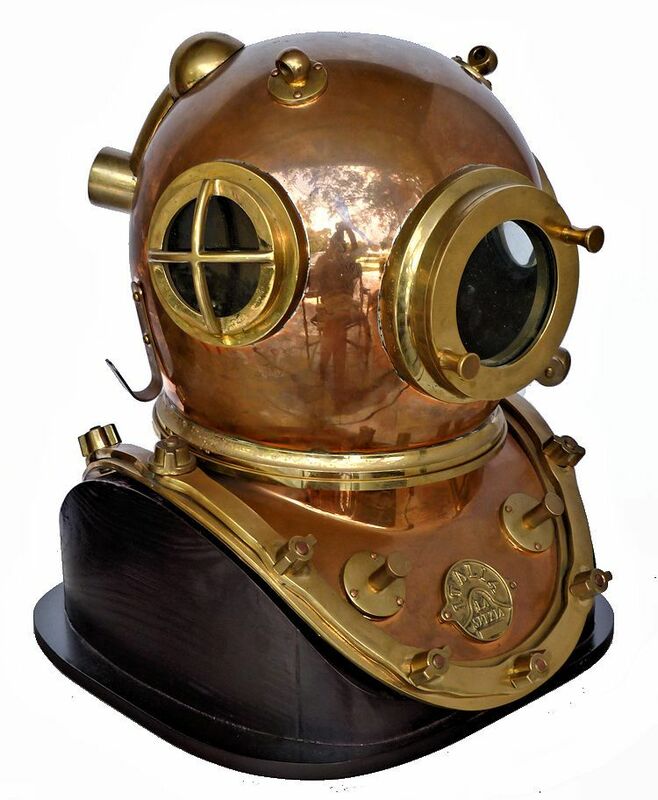 We specialize in high quality vintage diving helmets, knives and paraphernalia to appeal to the most discerning collector. We offer only the best of hard hats, diving pumps, and diving gear. On rare occasions we may offer a rare and interesting custom made high quality reproduction which will be clearly identified as such. The extremely rare helmet on the left is a US Navy MK V made by Schrader in 1919 which was retrofitted with a Heli-Ox system in the 1930's. Experts in the Historical Diving arena say they know of only one other. This one was sold by private treaty to one of our customers. There is a very brisk market in these highly sought after diving collectibles, so don't expect them to be on the market for long. Heading the list of helmets in demand are those of DESCO, Morse, Miller-Dunn, and Schrader in the United States. From Europe, look for Siebe Gorman, Heinke, Medi, Hagenuk, Draeger, Petit, Piel, Galeazzi, and Robison from Australia, and John Date from Canada. The picture of Joel & Julie Jacobs at the right was taken at an auction of dive helmets this year by Leslie Leany, Publisher of the The Journal of Diving History. 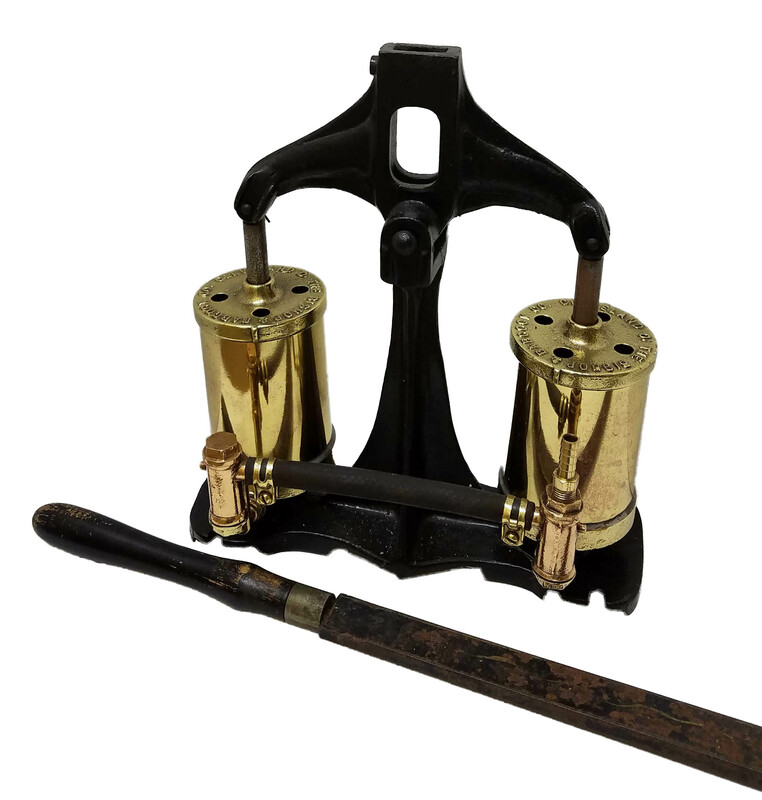 To view our new page devoted to antique and vintage dive knives, dive pumps and dive gear, click here! If you have an old vintage dive helmet for sale, you want to read this! A rare example of a shallow water dive pump made by the Bishop & Babcock Co. of Cleveland, Ohio. 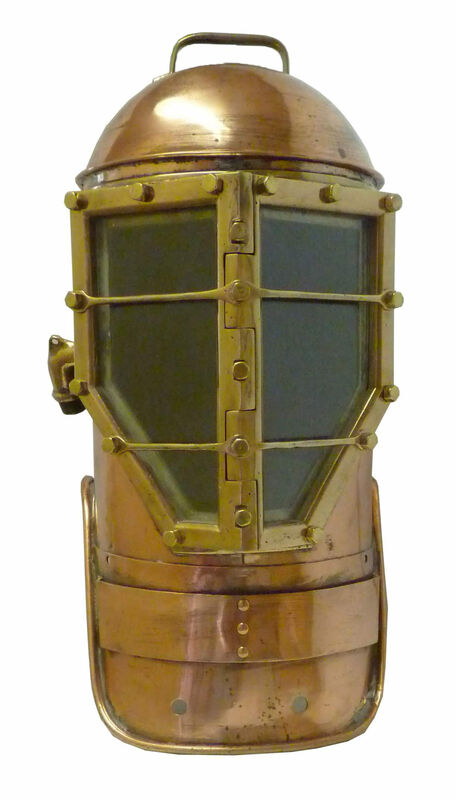 This style pump was used primarily with the Miller-Dunn Style 1 and Style 2 “Divinhood“ and Morse 15 dive helmets. SOLD to England. Thank you! Four Maker's Lead Weights 7 1/2 lbs ea. 52" LOA x 5 1/2" W Weight 36Lbs. Famous DESCO Air Hat or "Pot"
SOLD to France. Thank you! SOLD to Singapore. Thank you! SOLD to Canada. Thank you! SOLD to Foremost Collector. Thank you! SOLD to Australia. Thanks you! SOLD to Poland. Thank you! Length head 6" Length handle 15 1/4"
No markings except 1898 Patent date. Diameter: 11” Weight: 13.5 lbs. Breast Plate Only. No Bonnet! SOLD to Netherlands. Thank you! SOLD to Australia. Thank you! SOLD to Switzerland. Thank you! 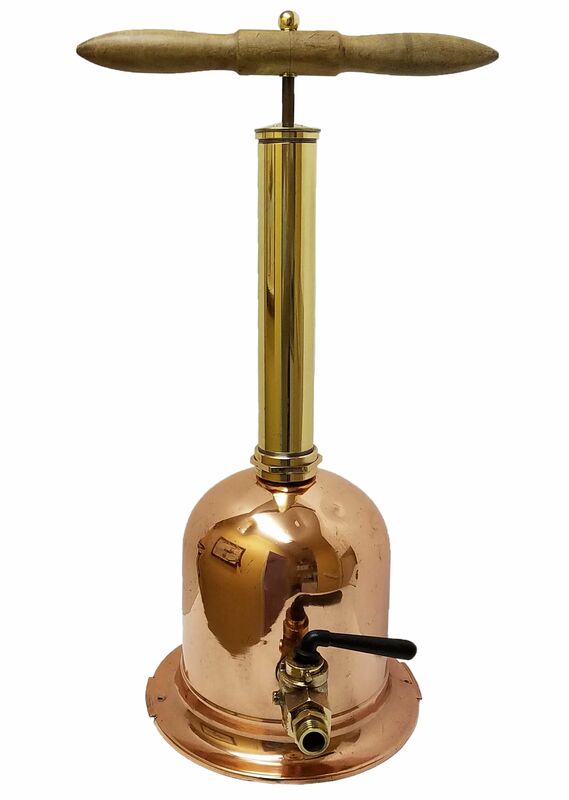 Outstanding Patina Stand Not Included! SOLD to AUSTRALIA the day listed. Rare style with Bronze Hilt & Belt! MK V Helium Dive Helmet New Old Stock! SOLD to Italy. Thank you! 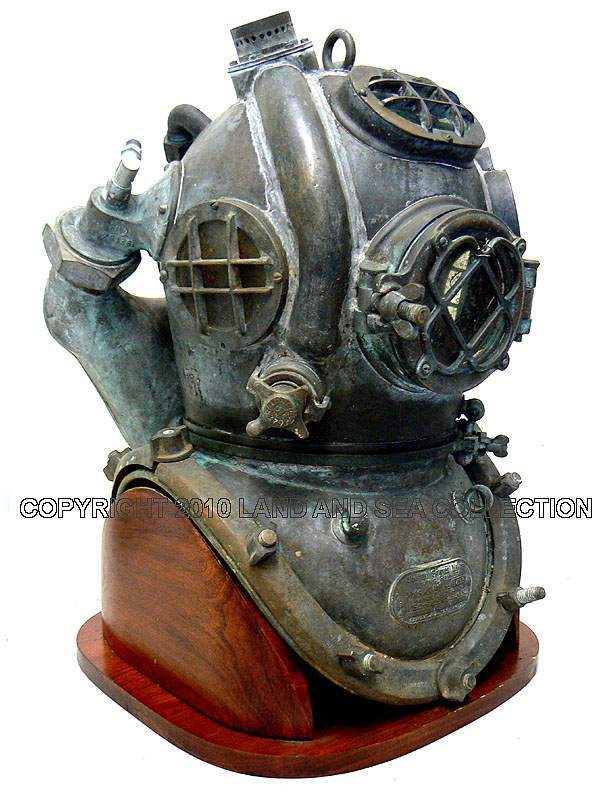 Rare 1944 Diving Equipment & Salvage Co.
SOLD to Hollland. Thank you! One of the original few! Rare C.E. Heinke Ca 1896 Built 1938? SOLD To Belgium. Thank you! SOLD to France, Thank you!